Last night in an unusual occurrence my almost 11 year old son fell asleep on our downstairs’ couch. As I tried to lift to carry him upstairs to his bed, I quickly realized that even though of average size for his age, he was now far too big and tall for the traditional carry — his arms around my neck, one of my arms around his back and one under his legs. So, deciding against the over the shoulder fireman carry, I simple assisted him walk up the stairs and onto his bed. Though most parents rely on age or school year to measure children’s growth, last night’s event marked a more profound change, an observation probably resulting from viewing earlier in the evening the last installment of the Toy Story trilogy. The original Toy Story has led my list of favorite animated movies since its debut, and neither TS # 2 or #3 have or will amend that list. TS#1 in particular enjoyed the right balance of action, humor and snide remarks combined with the “all’s well that ends well” ending. The second Toy Story was perhaps as good as any sequel, just not the original. 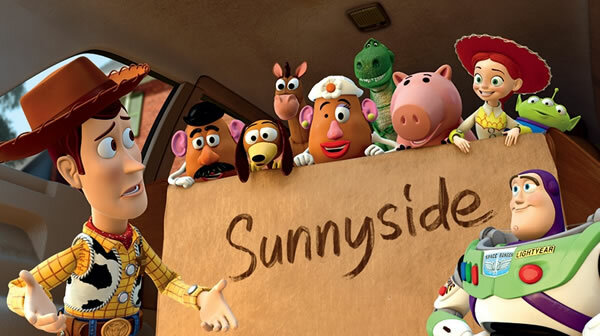 Toy Story 3, much to my chagrin, hit me where it hurts; and not just the funny bone. It too possesses sharp dialogue, witty references and stunning animation while continuing to provide on point childhood insight from the toy perspective. But by focusing on the life cycle high school graduation and college matriculation stage, Toy Story goes for the heart without being overly sugary or clichéd. It brought to mind Peter, Paul and Mary’s Puff the Magic Dragon though Woody, Buzz and company do much better than Puff’s final destination. And as I see my son, the youngest of two, stand halfway between Andy’s Room and Honah Lee, I relish watching his childhood, whether I can carry him or not.